The Nano Cube Complete PLUS nano aquarium will bring the wonders of tropical underwater worlds right into your home. See below for the best deal on Nano Cube Complete PLUS 30 Litre. 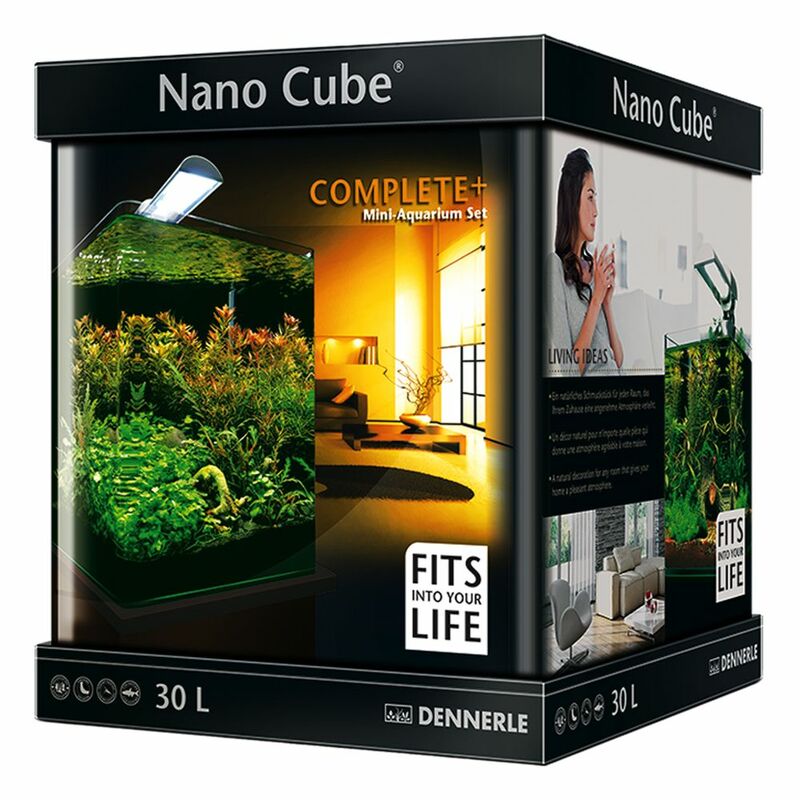 Big Savings on Nano Cube Complete PLUS 30 Litre! The Nano Cube Complete PLUS nano aquarium will bring the wonders of tropical underwater worlds right into your home. Experience the colourful, bizarre and endlessly fascinating creatures of the nano aquarium world - from idiosyncratic shrimps to lush, green plants. The Dennerle Nano Cube lets you re-discover aquatics. The 30-litre mini aquarium will fit into any room and will be a breathtaking eye-catcher in kitchen, bathroom, lounge or bedroom. The office is a particularly popular setting for nano aquaria. Lean back, relax and escape into a fascinating nano world. The Dennerle Nano Cube Complete Plus comes completely equipped with everything you need for a quick and easy start to mini aquatics. Nano Cube Complete PLUS 30 Litre at a glance: Nano Aquarium with panorama window Dimensions: 30 x 30 x 35 cm (L x W x H) Capacity: 30 litres Cover panel with handle hole & holder Black rear panel foil Foam underlay Nano corner filter Nano Light 11 Watt/ 6000 K 4kg Nano Nano Shrimps Gravel Bed, Sulawesi Black 2kg Nano Nano DeponitMix nutrient medium Nano thermometer Note: Plants and decoration not included. Try out nano aquarium technology and bring the magic of tropical aquascapes into your home! Please note: This device is designed for use in Germany and thus comes with a power adapter for use in the UK. Whats this? The Nano Cube Complete PLUS nano aquarium will bring the wonders of tropical underwater worlds right.. The Best Deals online for Nano Cube Complete PLUS 30 Litre and your essential Pet Supply Products. Order over £29 and get FREE DELIVERY on all orders today. Most orders are processed and dispatched within 24 hours from this supplier (zooplus) and their delivery service partners provide online parcel tracking facilities, active from 2-3 days after dispatch of your Nano Cube Complete PLUS 30 Litre order. The suplier 'zooplus' offers International shipping to the countries listed in the table below for shipping on Nano Cube Complete PLUS 30 Litre.